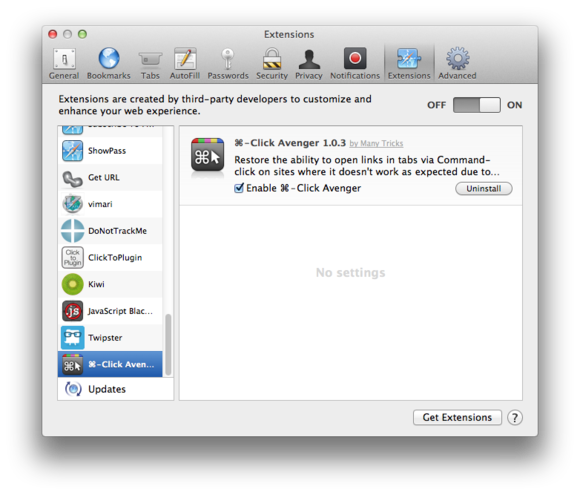 With ⌘-Click Avenger installed, whenever you Command-click a link (or right-click it and choose Open Link In New Tab), the link opens in a new tab, regardless of what the website's developers want. ⌘-Click Avenger doesn't do anything else, but if, like us, you prefer to browse using tabs, it's enough to remove a good amount of Web-browsing frustration. Frustrated by websites that won't let you open links in new tabs? ⌘-Click Avenger fixes that problem in a jiffy.